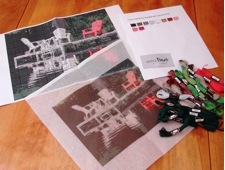 Dog Needlepoint Kits have to be one of the most popular themes at NeedlePaint. Not only do we put them on our homepage, but our craft space and warehouse also is dog friendly with normally 1-3 dogs here on any given day. As they are such great friends, I’m writing today to help people who have amazing photos of their dogs to select the best photos for needlepointing. OK, so that is not as good as I hoped. But, I think there is a lesson here. Lets go back to the original image. 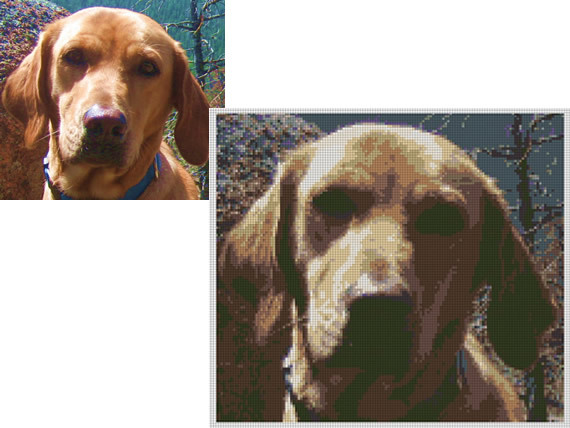 The background is very similar color to the dog, which when transferred to needlepoint, will loose a lot of contrast. 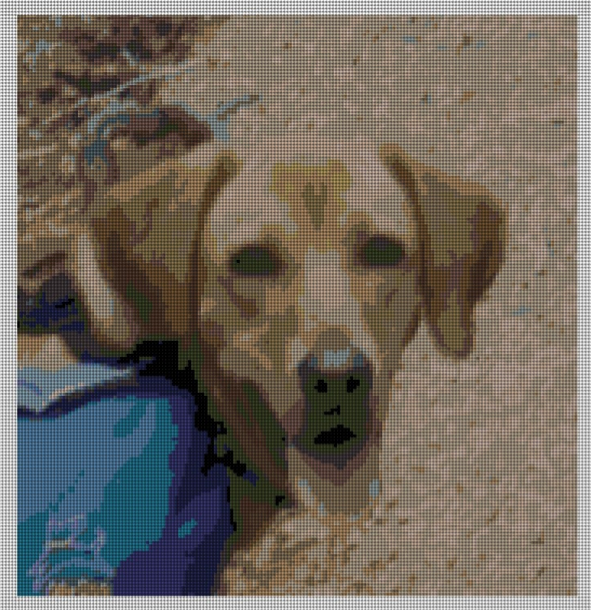 Also, the shadow below the dogs nose effects the dogs face on the canvas. So, lets try another. This one is a closer image, again, the top of the head came out well, but the bottom of the image is too dark. Hmm. Still not what I want. I think trying to focus even closer on the face may help. Overall, I have to say, that I tried a lot of uploading today and I learned a few things. #2. Images with a contrasting background seem to look better. #3. Dogs with markings really look great! See the image of my friends husky. On a final note, we are soon adding DMC threads to our site. This will also help our current situation, because DMC offers more colors, especially in the lighter pinks, browns, and creams. We’ve noticed improvement on images of people, which is the main reason for this, but I think Rusty will also look better! 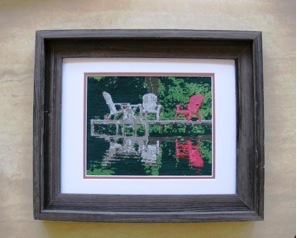 Lake Picture Turned into Needlepoint! 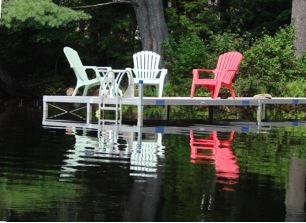 It has become a summer ritual at my lake in Maine to print an annual picture of my neighbor’s dock. This summer I decided to do a needlepoint picture instead of a glossy photo print using Needlepant.com so I could do a needlepoint picture instead. 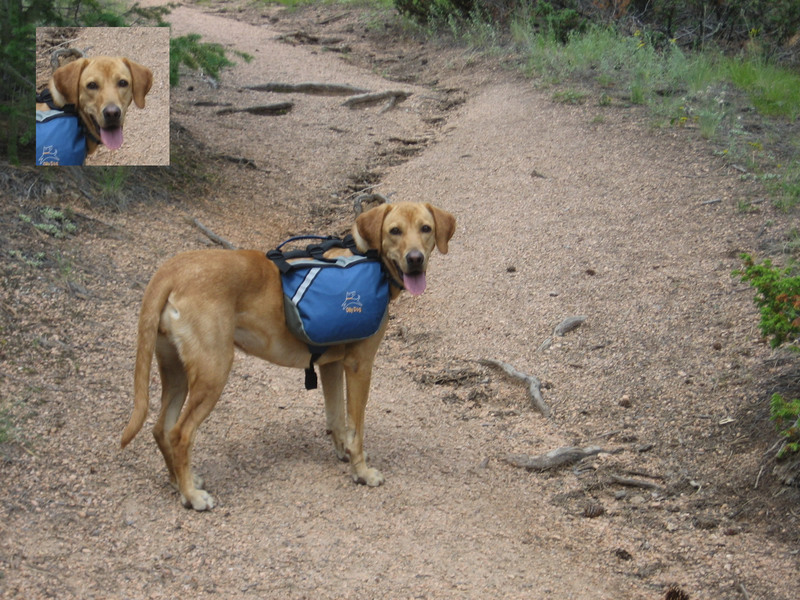 I had 2 photos from which to choose. 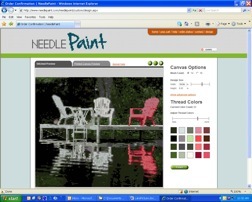 After viewing them on the Needlepaint web site, I decided that Dock1 had too much going on in it. There was too much going on in the background. 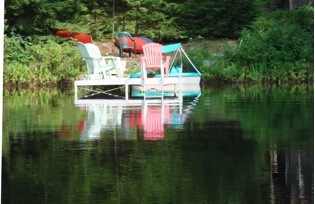 The blue and white paddle boat wasn’t recognizable, the green plastic chair disappeared into background, and the kayaks were distraction. 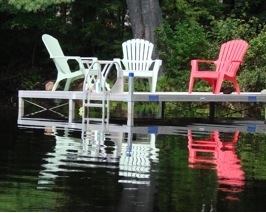 Dock2 by comparison was simple with the focus on the pink and white chairs with a good reflection in the lake. 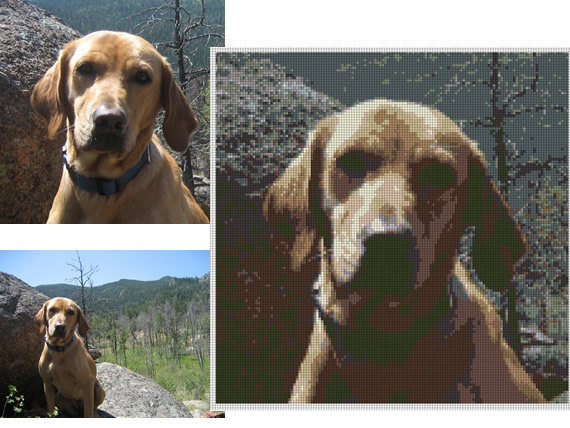 The background was not too detailed and the preview on Needlepaint.com reminded me of an Impressionist painting. Next I decided that I wanted my finished Needlepoint canvas to be an 8 x 10 and on 14- point canvas. I made a copy of the photo and I used a photo editor to crop the copied picture to the 8 x 10 proportions. I cropped out as much of the background as possible, making the chairs the major element of the piece. 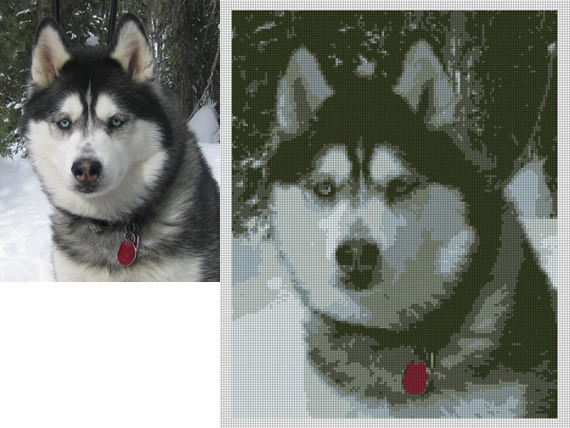 The first Needlepaint preview displayed the canvas with 20 colors. Although it looked great, I could see that it would be too difficult to needlepoint. There were too many different greens whose colors were so close that I would not be able to keep the colors straight. Also, these slight variations were not necessary. This canvas gave me enough definition to capture the idea of the photo and to produce a canvas on which the colors would be easy to follow. And, it was the Impressionist effect which I wanted. I put the canvas on my stretcher and was ready to go. Finished Needlepoint of the Dock! about the one light green stitch that was in the middle of the dark green. Or, if I wanted more light green in an area I could put it in. There was enough thread to make these changes as Needlepaint gave me full skeins of each color even it I only had a few stitches in that color. Also if I needed more, I could request more. I did need more dark green. I emailed Needlepaint and the thread arrived 4 days later in the mail. WHAT FUN! IT IS PAINTING WITH THREAD with a little help from the printed canvas. Once finished, I mounted it on Self-Stick Artboard (acid free). Then I framed it with two contrasting matt boards. A wonderful memory of Summer, 2009.